Since I added C-41 developing kits to the store the other day, I’ve had a few emails about developing your own film. I’ve been developing my film (Black & White initially, and then Colour) for a while now, but I can still remember the time before I did, and how daunting it was. For me, part of the problem was that initially, I saw a lot of very in-depth instructions on the web, as well as videos, but I just wanted to figure out a general overview. I hope this article will help with people in my situation, and I’ve decided to word some of it in a Question/Answer format. Is it hard to develop your own film? Nope! There are a number of steps you have to follow, but they’re all easy steps. To me, calling something “hard” means that you have to practice it before being able to do it, and also that you have to make choices/decisions along the way, which you might get wrong. Developing film is not like this. You just do certain pre-defined steps, and as long as you do the correct things, your film should turn out perfectly. What’s more, there’s less room for error than some people let on. People make some very scary claims about how perfectly, precisely, exact you must keep your water temperature, especially when developing colour film, but a lot of those claims are very exaggerated (in my opinion, some people like the idea that they have mastered a very tough process where you can’t vary your temperature by 0.5 degrees or else your film will be completely unusable). The thing you’ll notice if you spend any time discussing home developing online is that 99.9% of people say “you should do it, it’s great!”, and almost nobody ever says “Oh it was a disaster, sooo hard!” It just really is something almost anyone can do. Can you give me a really broad overview of the process? Sure! So first, you take a bunch of photos. You probably knew that step haha. Next, you have to transfer your film to a developing tank. This is basically a plastic jar that is designed to not let any light in. 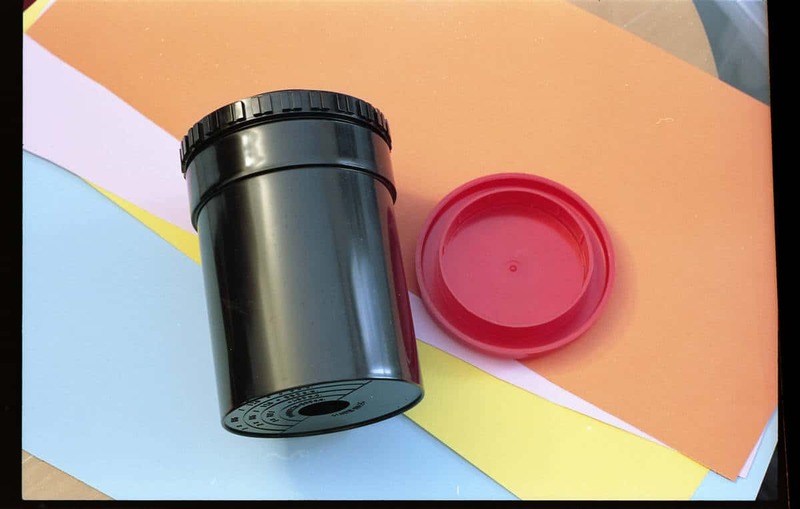 It has plastic reels inside that you spool your film around. Now that your film is in the developing tank, you pour in developing liquid and wait for a certain amount of time (between 3 and 10 minutes depending on the film and developing liquid). While you’re waiting, you agitate the tank once or twice per minute, by turning it over a few times. Now, you pour out the developing liquid, and you put in another liquid. The next liquid might be a few different things – it varies depending on whether you’re doing Colour film, or Black & White, but once it’s in there, you do the same thing: Leave it in for a certain amount of time, while agitating the tank 1 or 2 times a minute. Now, there’s one more chemical liquid to pour in. Again it might be one of a couple of things (Fixer or Stabilizer generally), and you leave it in for a certain amount of time, then remove it. Now you can open up the tank and you have negatives! You hang them up to dry. There are a couple of parts where you pour water into the tank during the process as well, to rinse the negatives. This might be at the end or the middle, depending on B&W or Colour, but it’s the easiest thing possible. Do you need a darkroom? The easiest way is to use a changing bag. This is a special, light-proof bag that you stick your developing tank and film in, along with a few other things (scissors, can opener to open the film can). It has holes with elastics around them, so you can stick your arms inside the bag without letting any light in. If you don’t have a changing bag handy though, it’s fine, you just need to black out a room for a few minutes. Personally, I’ve done it in both a bathroom, and a walk-in closet. In both cases, I just put a towel on the ground to block light from coming in the door, and I also put electrical tape up to cover the door cracks. While this is a dark room, it’s easy to set up when you need it, and isn’t the same as setting a complex darkroom with sinks and lots of equipment, like some people imagine it. That sort of darkroom is only needed when you actually print traditional darkroom photos (instead of scanning your negatives and sharing them online, or printing them on a printer). So wait, I have to transfer the film to the developing tank in total darkness? Isn’t that hard? You do indeed have to perform this step in total darkness (you can’t use a red light like you may have seen in movies, etc.- that’s for doing darkroom printing). This is the trickiest step, and the ideal situation is to have a cheap, or wasted, roll of film that you can practice with in the light. What I personally did was to watch a few Youtube videos very carefully, so that I was pretty sure I knew what to do, and then I tried it on a long-expired roll of no-name film I got at a camera show. I did it once in the light, and was very confident that I knew what was going on, so I took a regular roll of film I had shot (that wasn’t too important and wouldn’t kill me if I ruined), and I tried doing the procedure for real, in the dark. Watching the Youtube videos and practicing once paid off, and I transferred the film just fine, and it came out perfectly. If you don’t have a spare roll of useless film, it can seem painful to waste a roll to test this out. What I’ve always said is that hey, you can get a cheap roll for $5 CAD (even cheaper in US dollars), and I think you might as well just get one and shoot a bunch of quick snapshots, and chalk the few dollars up to learning a new skill. Having said that though, I still have a handful of unusable rolls handy that would be perfect for practicing, so if you make an order on Buy Film Canada, just make a note that you’d like one, and I’ll send it if I have one (I’ll also try to remove this part of this blog post when I run out, so if you see this, I probably have one). These rolls have been completely exposed and rewound, so photos will come out completely white from them, there is 0% chance of any photos coming from them, so please only request one if you need to practice transferring film to a developing tank. How much does developing your own film cost, is it cheaper? There’s an up-front cost that can run between $0 (if you find someone dumping their old stuff on Craigslist/Kijiji) to maybe $120 if you buy all the equipment brand new. Buying new is quicker and convenient, but old equipment does the job just as well, unless it’s damaged. Paying the up-front costs might not be fun if you buy everything new, but you can do what digital shooters do: Pay a bunch of money up front, and then magically forget that it happened, and pretend that everything you do from then on is free haha. Once you’ve paid the up-front costs, the actual cost of developing each roll is definitely cheaper than doing it at a lab. It depends what you use, but I would say that at most it’s going to be half the price of doing it in a lab, and a lot of people use chemicals very efficiently and spend much less than that (especially with B&W film). If you also figure in the costs of travelling to a lab, maybe paying for parking, etc., it definitely winds up a lot cheaper for most people. The main thing to really consider other than price is: Do you enjoy developing film? I used to think it was going to be a hassle, but I thought “Oh well, the round trip to a lab takes me 40 minutes, then another 40 minutes to go pick up the negatives later!” and did it. What I found out was that the process is very fun and relaxing to me, and it’s something I look forward to now. Other people might find the complete opposite though. A developing tank with reels. The most common of these are Paterson brand, and Buy Film Canada can actually special order these for you (and we’ll stock them if there’s enough demand). There’s also AP brand which are very similar, and also fine. A changing bag (optional). This is convenient to have, but if you can black out a room for 10 minutes, it’s not necessary. A timer. You can use your smartphone for this. A can opener to remove the lids of 35mm film cans. Scissors to cut the film from the canister. Some sort of clips to hang the negatives to dry. (I need to clarify this, but people do use laundry clips. Some containers to hold the chemicals – you can buy special ones fairly inexpensively, but I believe some people do use empty plastic pop bottles (thoroughly cleaned of course). If you want to develop colour film, there’s basically only 1 choice for home developers, that’s called a C-41 Press Kit. We sell them on Buy Film Canada, and they contain everything you need to develop colour film. Developer: Ilford Ilfosol 3 or Ilford DD-X or Kodak D76 or Kodak HC-110 or Rodinal (also sold as Blazinol). There are many other developers, these are the most popular. Fixer: Ilford Rapid Fixer or Ilford Ilfostop Stop Bath or Kodak Fixer or Kodak Kodafix. As you can see, there are a lot of options, but they’re all decent choices. To start, you probably just want to pick whichever you can find most easily. Buy Film Canada doesn’t sell any B&W chemicals right now, but we have access to them, so if you’re interested, drop us a note, and if a few people are interested, we’ll stock them! Well, that’s about it for now. I hope this accomplished the goal of just sort of giving a wide angle overview of developing.